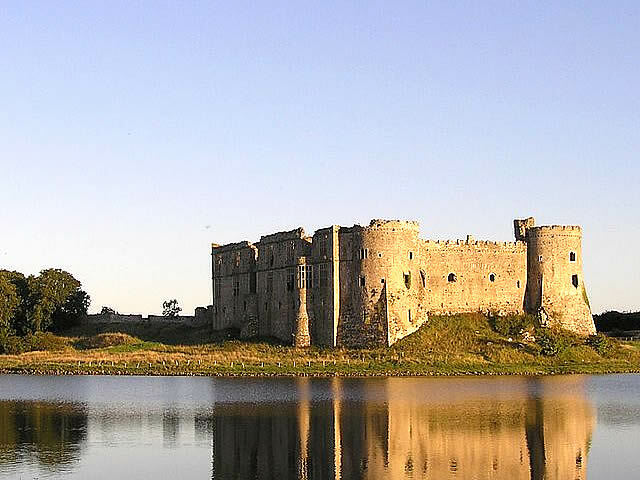 Carew Castle is a castle in the civil parish of Carew in the Welsh county of Pembrokeshire. The famous Carew family take their name from the place, and still own the castle. The present castle, which replaced an earlier stone keep, is constructed almost entirely from the local Carboniferous limestone, except for some of the Tudor architectural features such as window frames, which are made from imported Cotswold stone. Although originally a Norman stronghold the castle maintains a mixture of architectural styles as modifications were made to the structure over successive centuries. Entry to the inner ward is across a dry moat that had a barbican and gatehouse. The front of the castle had three D-shaped towers and crenelated walls. The rear of the castle has two large round towers. In the 16th century the northern defensive wall was converted into a Tudor range with ornate windows and long room. The outer ward has earthworks that were built by Royalist defenders during the English Civil War in the 1640s. The use of the site for military purposes extends back at least 2000 years. The castle stands on a limestone bluff overlooking the Carew inlet — a part of the tidal estuary that makes up Milford Haven. The site must have been recognised as strategically useful from the earliest times, and recent excavations in the outer ward have discovered multiple defensive walls of an Iron Age fort. The Norman castle has its origins in a stone keep built by Gerald de Windsor around the year 1100. Gerald was made castellan of Pembroke Castle by Arnulf of Montgomery in the first Norman invasion of Pembrokeshire. He married Nest, princess of Deheubarth around 1095. Nest brought the manor of Carew as part of her dowry, and Gerald cleared the existing fort to build his own castle on Norman lines. The original outer walls were timber, and only the keep was of stone. This still exists in the later structure as the "Old Tower". Gerald's son William took the name "de Carew", and in the middle of the 12th century created an enclosure with stone walls incorporating the original keep, and a "Great Hall" inside it. The current high-walled structure with a complex of rooms and halls around the circumference was created in about 1270 by Nicholas de Carew (d.1297), concurrent with (and influenced by) the construction of the Edwardian castles in North Wales. At this time, the outer ward was also walled in. The de Carews fell on hard times in the post-Black Death period and mortgaged the castle. It fell into the hands of Rhys ap Thomas, who made his fortune by strategically changing sides and backing Henry Tudor just before the battle of Bosworth. Rewarded with lands and a knighthood, he extended the castle with luxurious apartments with many Tudor features in the late 15th century. An inner doorway is decorated with three coats of arms: those of Henry VII, his son Arthur and Arthur's wife Catherine of Aragon. This allegiance turned sour. Rhys' grandson Rhys ap Gruffudd fell out of favour and was executed by Henry VIII for treason in 1531. The castle thus reverted to the crown and was leased to various tenants. In 1558 it was acquired by Sir John Perrot, a Lord Deputy of Ireland, who completed the final substantial modifications of the castle. The Elizabethan plutocrat reconstructed the north walls to build a long range of domestic rooms. Perrot subsequently fell out of favour and died imprisoned in the Tower of London in 1592. The castle reverted to the crown and was finally re-purchased by the de Carew family in 1607. In the Civil War, the castle was refortified by Royalists although south Pembrokeshire was strongly Parliamentarian. After changing hands three times, the south wall was pulled down to render the castle indefensible to Royalists. At the Restoration the castle was returned to the de Carews, who continued to occupy the eastern wing until 1686. The castle was then abandoned and allowed to decay. Much of the structure was looted for building stone and for lime burning. Since 1984 Cadw has funded a substantial amount of restoration performed by the Pembrokeshire National Park Authority. 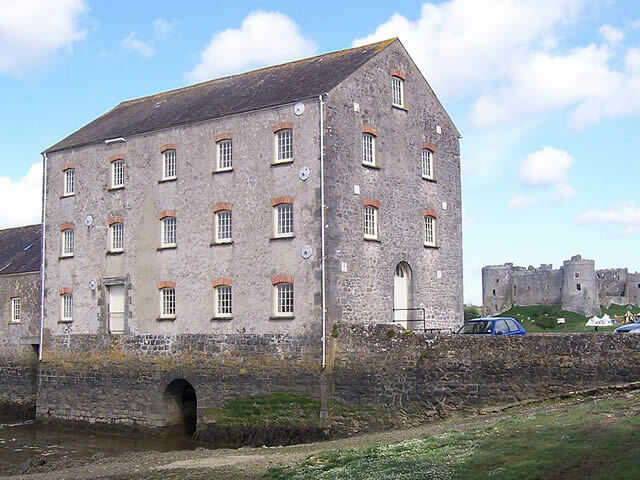 Carew Mill is the only intact tidal mill in Wales and one of only four in Britain. While its precise date of origin is uncertain, documentary evidence indicates a mill of some kind was here in 1542. The first reference to a causeway comes in a commission of 1630, indicating that Sir John Carew had restored the floodgates and causeway walls some 15 years earlier. The present building dates from the early 19th century and indeed one of the two mill wheels carries the date 1801. The mill has also often been referred to as the "French Mill", which may be a reference to the use of French burr grinding stones or to its French inspired design. Even this far inland the tide could provide significantly more power than the regular flow of a river. There are free guided tours at the Castle daily at 10.30am and 2.30pm, excluding school holidays. There is wheelchair access to the ground floor of the Castle and Mill and both shops. The mile-long walk is also wheelchair friendly. There are two disabled toilets situated at the Castle Visitor Centre and Mill Lane (opened with RADA key, please ask in the Mill for this). A mobility scooter and wheelchair are available for hire on request from the Castle Visitor Centre. A hearing loop is located in the Castle Visitor Centre. There are toilets at the Castle Visitor Centre (Please note: there are no public toilets at Carew Tidal Mill). There is ample free parking for cars and coaches. There is a picnic site situated on the north side of the Millpond with spectacular views of the Castle, a second picnic site is located on the Castle green overlooking the Millpond. Well behaved dogs are welcome; please keep them on a short lead. Location : Carew Castle, Carew, Tenby Pembrokeshire SA70 8SL. Transport : Tenby (National Rail) then bus (361). Bus Routes : 361 stops close by. Opening Times : Daily 10:00 to 17:00.